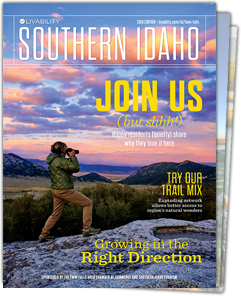 The City of Rocks Scenic Byway is Southern Idaho’s jewel: A 49-mile necklace of unspoiled, rural landscape that encircles the Albion Mountain Range. It’s jam-packed with amazing stops and makes a weekend getaway. Trail Begins: In Albion on Idaho 77. Outdoor Fun: The byway traverses the outskirts of the Pomerelle Ski Area and the Cleveland Recreation Area as it heads south. Climbing Paradise: At the byway’s center is a gem of a destination, the City of Rocks National Reserve, home to more than 700 challenging climbs — as difficult as Yosemite,but without the crowds. Ask a Local: Stop by the visitor center in Almo for travel information from the people who know this area best. Trace The Path of Emigrants: Be sure to explore the wayside exhibits that interpret the historic 1843-1869 California Trail migration that passed through the area. History & Architecture: On the last leg of the byway, visit historic Oakley, home to the state’s largest concentration of old stone and wood-framed buildings. In fact, the entire town is on the National Register of Historic Places.